This reads "See 7 States / Rock City", referring to a tourist attraction called Rock City at Lookout Mountain near Chattanooga along the Georgia-Tennessee border. Rock City was created in the early 1930's by Frieda and Garnet Carter. 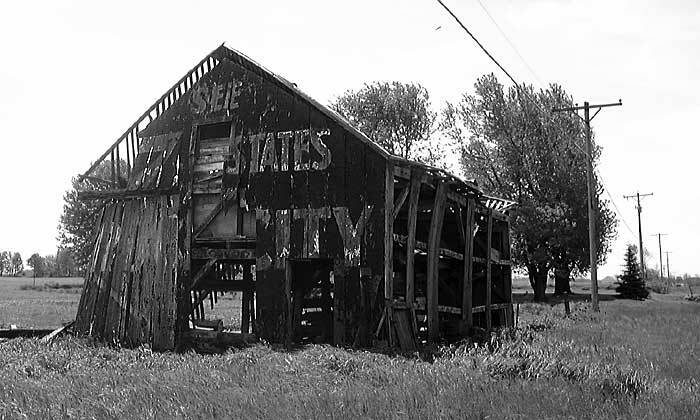 In 1935 they hired Clark Byers to paint advertising messages on barns like this one. Byers is supposed to have painted around 900 barns. Many were along the highway known as the Dixie Highway (US 25 in Ohio) which ran north-south from Ontario, Canada to Florida through Michigan, Ohio, Kentucky, Tennessee, North Carolina, South Carolina and Georgia. More about the Dixie Highway can be found at Dixie Highway. More about Rock City can be found at seerockcity.com, including photos of Rock City barns by Dave Jenkins.